(Admission Office – Van Lang, 15th, December 2018) – This December, the Faculty of Industrial Arts received the good news: Interior Design students won the Talent Award and the Third Prize in in Young Designer Awards 2018 contest, the theme "Forward - Humanity In New Design Language ". As reported, Young Designer Awards 2018 was a playground for students majoring in Architecture and Interior Design in 15 Asian countries. In Vietnam, the competition attracted students from many leading universities in these majors: Hanoi Architectural University, National University of Civil Engineering, University of Architecture Ho Chi Minh City, Ho Chi Minh City University of Technology, Van Lang University and Ton Duc Thang University, ... In the top 30 projects after the preliminary round, the 10 best projects were chosen to compete in the final round for the First, Second, Third Prize and Talent Award in December 2018. MA. 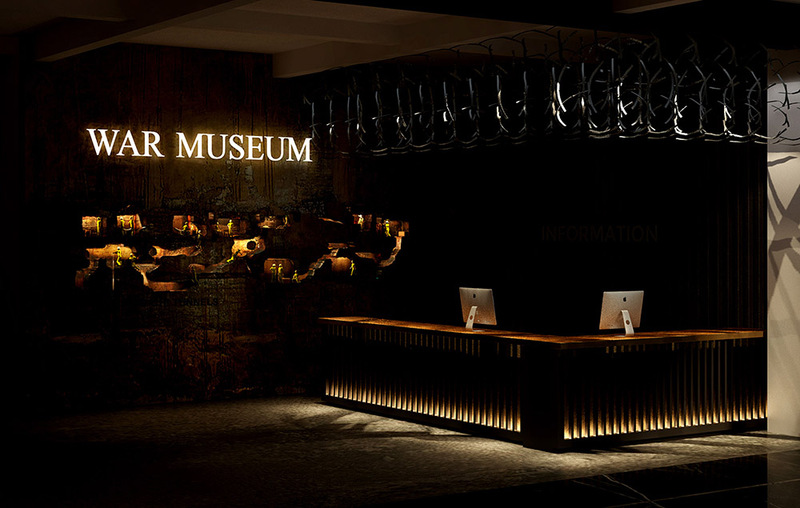 Le Long Vinh - Head of Interior Design at VLU was the one who guided his students to complete the projects - "Reply Babel" and "War Museum"
In 2018, there were 10 student projects of VLU in the field of Interior Design submitted to the competition. As a result, there were 7 projects selected after the preliminary round (accounting for nearly a quarter of the total number of selected projects in the top 30) and 2 projects selected for the final round. 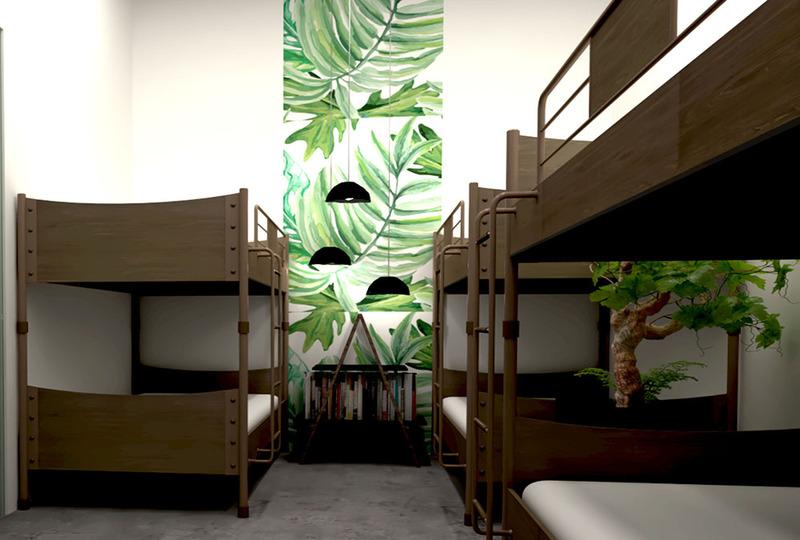 In particular, the "Reply Babel" project by Pham Thi Thuy Duong – the sophomore in Interior Design was one of the 3 best projects of Vietnam to attend the national final round. 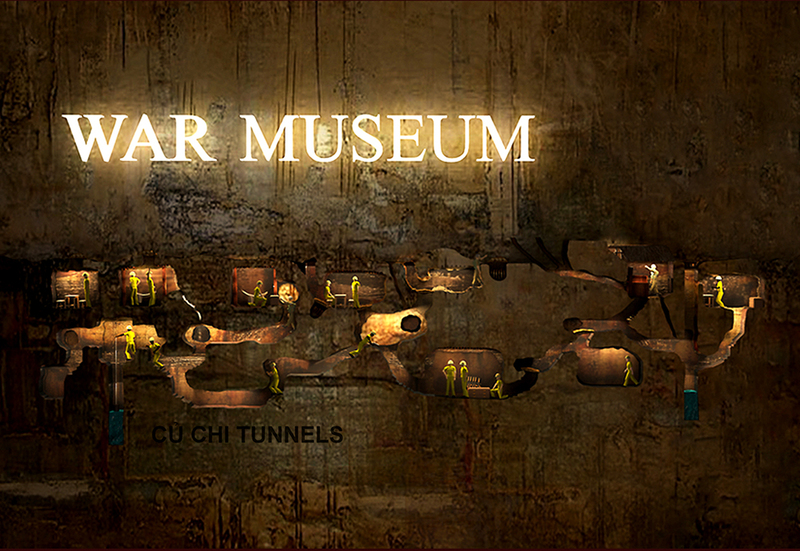 The "War Medium" project by Mai Chi Cong and Dinh Thi My Uyen received the Talent Prize - Color Design Idea. Thuy Duong – the author of the project "Reply Babel" had an impressive and attractive presentation with her careful preparation and good interaction with audiences and judges in the national final, 09/12/2018, at the Liberty Central Saigon Citypoint Hotel (District 1, Ho Chi Minh City). 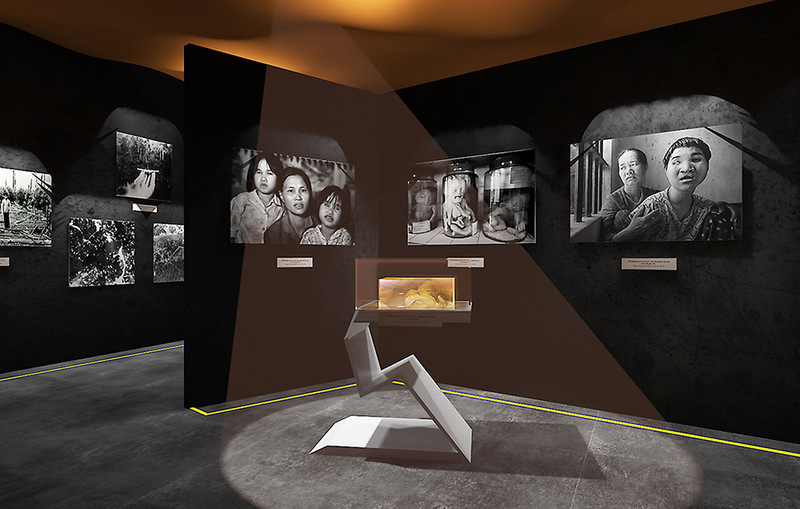 "Where things start from the end"
Inspired by the image of a lighthouse illuminating the way for offshore boats at night, Pham Thi Thuy Duong - author of the project "Reply Babel", designed a tower - as a homestay for the women who just release from prison to aspire to a career and cultivate their mind - a transition step before they reintegrate into the community. The sitting room was designed with a round space to create a cozy feeling. The classroom space, in addition to the function of a class, also has many other functions such as organizing vocational workshops, holding parties. In the middle of the room, there is a large staircase which takes light from the skylight, bringing energy and vitality to the people living in the tower. Meditation space is located in the highest position of the building with the cool air and the peaceful scenery. This is such an ideal place for a person to calm down and look back at himself. The main color is green which creates a cool feeling. The color shift from dark to bright shows the spirit looking ahead - the efforts of female prisoners. “Reply Babel” was designed with environmentally friendly materials such as bamboo and wood, bringing a peaceful and rustic feeling. Light is the key element when building the tower with the cover of glass to make the most of the sun's light, helping to widen the space and creating an airy feeling for female prisoners who have lived so long in dark and stuffy cells. This will be an ideal place for those who reintegrate into the community without any captious looks, disparaging words or the refusion of their "imperfect" past. 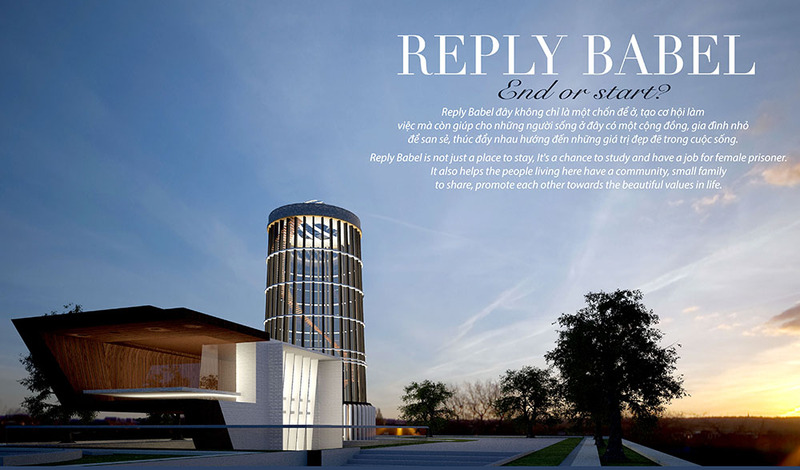 "Reply Babel" is not only a place to stay but also a vocational school to help them find jobs in the future. They are taught some soft skills such as communication and problem solving through the practice of tourism and hotel activities; implementing their knowledge and improving English so that they can reintegrate into the community better. This place will be like a family for them to share and encourage each other towards good values; at the same time, it is a bridge to expand the relationships with the outside world. The judges appreciated Thuy Duong's idea, and made many contributions to the project in terms of functional use to make it better. The author not only wanted to create a space for people to live but also sent a meaningful message to the community: "Let’s open the door to light. Let’s begin to change your perception and use the humanistic light to release the pain. Let’s be more tolerant of those who have made mistakes in the past for their trying to repent every day. Only then will it end the vicious circle: the recidivism of prisoners is more and more growing currently. “Reply" means a positive response to the cries of the misdeeds in the past when they want to reintegrate into the community. The message "End or start? - where the beginning is from the ending” has such great meaning. Thuy Duong said: “I am very happy to join the competition. I have the opportunity to share my ideas and receive valuable comments from the leading experts. A lot of my teachers and friends feel sorry for me to stop at the Third Prize because my project is very promising for going further. The Organizing Board also highly appreciated my ideas. But for the very first time I did a project in a big contest, with my limited knowledge, the result was a good start. I myself have received a lot of professional recommendations in the field. This is my first project and this result marks an important milestone in my life. It affirms that I am being on the right track, helping me have more confidence and passion for making my dream of becoming an interior designer in the future. Studying the Interior Design major ơ-at VLU was really a right decision. VLU has given me a great learning environment." “Reply Babel "- won the Third Prize. Mr. Ee Soon Hean - General Director of Nippon Paint Vietnam Co., Ltd awarded Thuy Duong at the national final on 09/12/2018. Orange, red, black, and blue are the four main colors used alternately throughout the building to create visual impressions and warning signals. 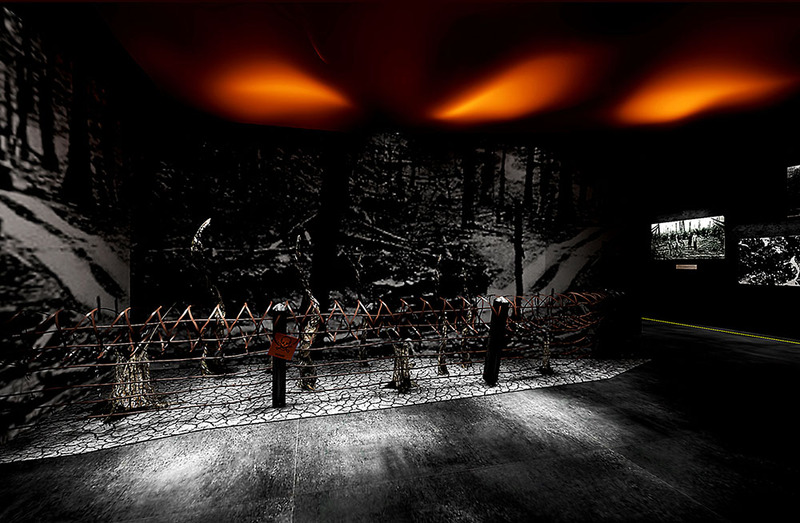 It can be the space that is tinged with the fire-red of fires and bombs, through the depiction of the deadly atmosphere of Quang Tri city when the US army dropped 328 tons of bombs and bullets: thousands of kilometers of the destroyed forests along Truong Son road, the up and down areas like the shapeless tumors that the victims of Dioxin toxic have suffered ..., the harmful effects of Dioxin poison. 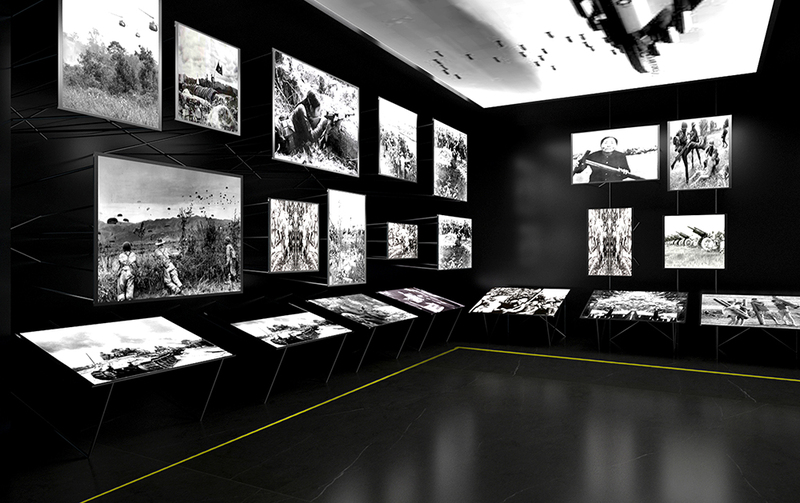 The space recreates the hard life of Vietnamese army in Cu Chi Tunnels - a revolutionary historical monument and a unique architectural work showing the talent and cleverness of Vietnamese people. Color use is one of the important grading criteria of Young Designer Awards 2018. 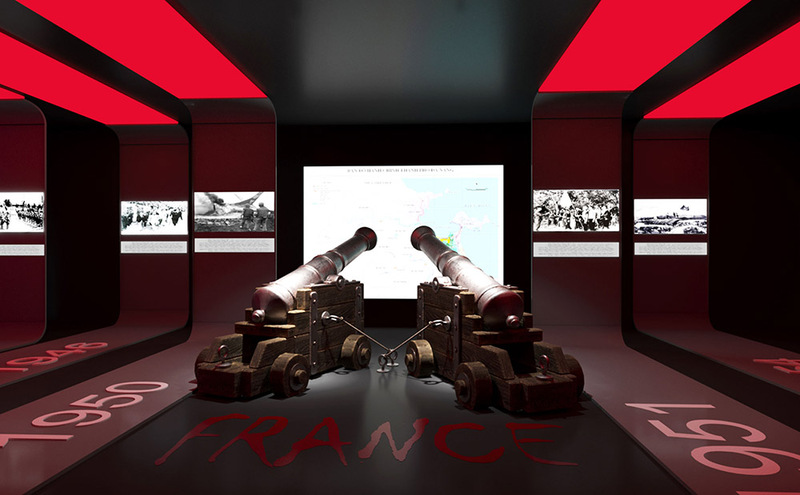 War Museum has showed the ability to combine colors harmoniously in design, creating the remark for the project and revealing the creativity in color use of the authors. The Organizing Board highly appreciated the use of colors: "Effective use of light helps to highlight the exhibits; the exhibition areas are separated by different colors, making an effective indication. Designing the light to focus on the artifacts with different colors is a clever idea because the museum is quite dark. “Everyone has the right to live and the right to be happy. Stop the war!” This is the message of the project “War Museum” that the authors want to spread. From the above message, the two future interior designers want to uphold the slogans: "Stop senseless wars, protect the peace" and “All nations! Let’s unite together". 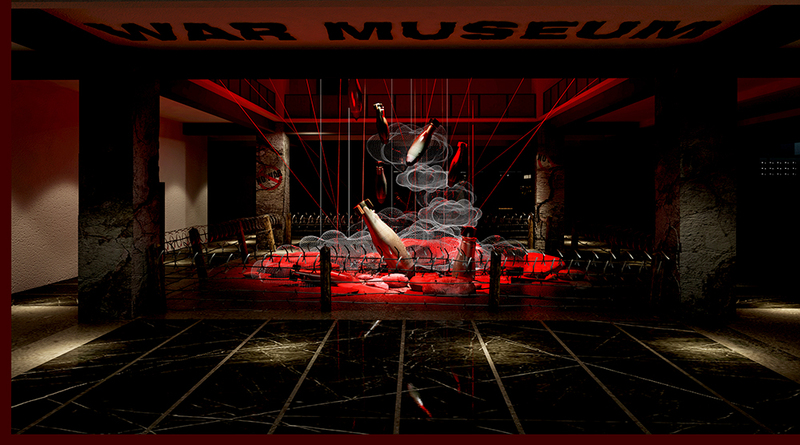 In addition to "Reply Babel", "War Museum", there were also 5 projects of VLU’s students in the top 30. All were displayed at the national final of the contest. According to the Organizing Board, the projects of VLU students had good quality since they met the requirements of materials, light and color as well as expressed the soul of future interior designers who are towards the community and has responsibility to life with a kind spirit: they care about the unlucky people in society, offer solutions to improve life, maintain and respect the identity the national character and traditional values. With these achievements, once again, congratulations on the teachers and students of the Faculty of Industrial Arts for imprinting in the professional playground - Young Designer Awards 2018. 5. "Ernest Cocochinchine" - Luu Vinh Phat - senior.